In yacht racing, sailors are at the mercy of the wind and occasionally too much of it or too little. 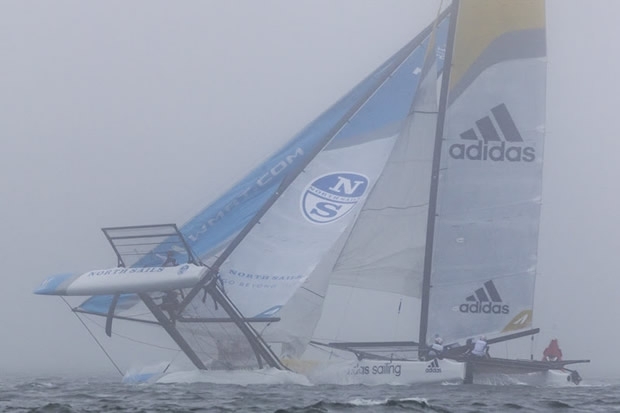 However on the opening day of the World Match Racing Tour’s Newport stage, crews faced a fog so thick that at times it was hard to see the bows of their M32 catamarans, let alone marks of the course. As usual with the modern-day WMRT race format, the first two days of this event are Qualifying fleet races to determine day three’s ‘Super 16’. Five high performance M32 catamarans are being used, so the 20-strong line-up has been divided into four groups and through patience the race committee was able complete all but two races of today’s full schedule. Stand-out performers of the day were New Zealand’s Chris Steele and his 36 Below Racing crew in Group1, Sally Barkow’s Team Magenta 32 in Group 2 and the Yann Guichard-skippered Spindrift racing crew from France in Group 4, none of whom finished a race lower than second. Steele attributed their result today to having come into this regatta fresh from last week’s qualification event. “That was massive in our preparation for this event. While we aren’t anywhere near some of the other top teams, coming off three days of racing is what helped this morning,” concluded Steele. During the first group’s racing, the M32s were sailing under full mainsails in wind gusting to 16 knots. In this even the normally immaculate Taylor Canfield and his US One team got caught out and flipped their M32. Coming out on top in Group 3 was GAC Pindar skipper Ian Williams, but he ended the day only a point ahead of American Michael Menninger’s 13Fifty Racing after taking not one, but two, course marks for a trawl during his group’s final race.